Like many citizens of Berkeley, I fancied myself a player on the world stage—too busy to spend much time on local issues. In the spring of 2016, I was just home from Standing on Sacred Ground screenings in Australia and Papua New Guinea when the phone rang and the ancestors reached out and grabbed me. Sitting between Corrina and Malcolm, we listened as our worst nightmare unfolded before us. A five-story apartment-retail complex was being proposed for the 2.2- acre site popularly known as Spenger’s Parking Lot, a north-south stretch of asphalt between Spenger’s fish restaurant and the train tracks. 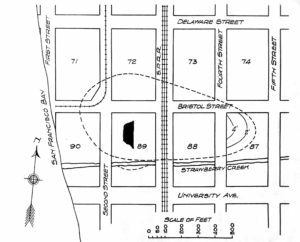 The land was designated a Berkeley City Landmark in 2003 because it lies at the center of an Ohlone maritime village that featured a massive shellmound which grew for 5,000 years by the reliable freshwater stream settlers later named Strawberry Creek. Even as the developers described a monster cash machine that would remove ten feet of earth, we visualized colorful abalone shells, flocks of shorebirds and tule canoes riding winter floods to net migrating salmon. We imagined grizzly bears, oyster shells and Ohlone families warmed by countless fires. As the shellmound grew to a height of 30 feet over the millennia, it featured ceremonial roundhouses, homes with burials out back, and ceremonies on top that oriented straight out to Alcatraz and the Golden Gate. The massive mound was larger than a football field, and its tremendous weight slowly pushed burials down into the soft wet ground below. Fires on top of the mound could be seen across the bay and conveyed messages to other shellmound people. The village Corrina remembers as Huichin thrived for hundreds of human generations. Smallpox and missions took a huge toll before gold rush genocide scattered the remaining Ohlone into nearby hills. Early Berkeley settlers later destroyed the shellmound to pave muddy streets and fertilize their farms. The developers assured the zoning board that the shellmound was to the west of the Spenger’s Parking Lot property boundary and asserted that the proposed building site has no archaeological value whatsoever. The project’s Ohlone consultant admitted that the entire village site is still considered sacred to descendants of the ancestors buried there. That dramatic evening launched a series of 35 meetings at the David Brower Center over the next two years. We debated how to tell the story, how to get comments on the Environmental Impact Report from respected archaeologists, how to attract media attention during a housing crisis, and whether to challenge U.C. Berkeley’s hoarding of 15,000 human remains. Suddenly, on March 29, 2016, just across the street from the parking lot, construction workers digging a trench unearthed the first of four human burials. Apparently, that project was small enough that no permits had been required. The remains were taken away by the same Ohlone consultant who also runs a side business cleaning, storing and reburying ancestral remains in a Catholic cemetery in Fremont. There were a few local newspaper articles about these sad events but few people noticed or seemed to care. A few months into the campaign we realized we needed an alternative vision. It’s not enough to fight against a housing development that threatens a burial site. We needed to propose an inspiring new concept. 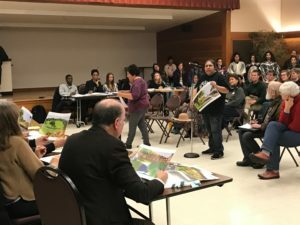 After another Zoning Board meeting where the draft Environmental Impact Report was presented, a local landscape architect, Chris Walker, approached Corrina and offered to help. Chris did some sketches. Corrina liked what she saw. She said, “The community will need to discuss this. But let’s present it as a concept, not a proposal, to the Landmark Commission.” The drawings of a cultural park were inspiring and they very quickly took on a life of their own. 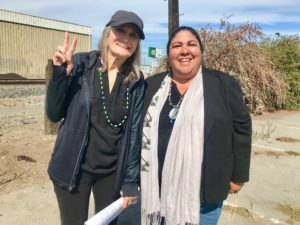 Corrina and Ohlone elder Ruth Orta presented the drawings to Berkeley city officials in February 2017 and the powerful images breathed life into an alternative future. They were printed in newspapers, published online and shared on Facebook. 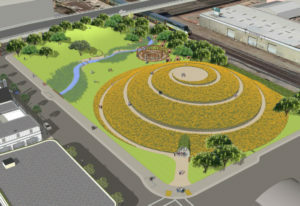 Viewers marveled at an orange, poppy-covered mound with a spiral pathway rising above a daylighted Strawberry Creek flowing past a ceremonial dance arbor. Shellmound supporters began to show up by the dozens. As Corrina and I met with city officials, activists played a cat-and-mouse game in the parking lot. No sooner had the developers blacktopped over a colorful “PROTECT THE WEST BERKELEY SHELLMOUND” mural than the midnight activists would be out in the dark repainting the logo. We photographed each mural and they live on like Ohlone memories of the village. There would be no smothering this campaign. Corrina based her resistance on prayer and deeply felt obligation to her ancestors. She convened interfaith prayer ceremonies at the site where hundreds listened to profound, heartfelt speeches, rap poetry and Ohlone songs. Tibetans, Koreans, Aztecs and Hawaiians offered solidarity. We made three short films for YouTube and as the crowds grew we could feel the momentum build. Democracy Now’s Amy Goodman interviewed Corrina as they stood above shellmound burials. It was an incredible experience to watch so many Berkeley residents tilt their heads and say, “Wait, you mean right here, an Ohlone village was born 5,000 years ago with burials in a shellmound?” You could see the light go on as people who thought they knew a lot about history felt a wave of humility as they realized, “If we can’t protect a sacred burial site right here in Berkeley then what hope is there that it can be done anywhere?” It felt good to finally be working for sacred site protection in my own hometown. In May of this year, I wrote two long blogs challenging the lies told by the developer’s archaeologist. We created a sequence of 15 maps to show the history and cultural significance of the site. We found photographs of the 1950 U.C. Berkeley archaeological dig that unearthed 94 human remains and thousands of artifacts. Chris Walker travelled all the way to the Museum of Natural History in New York and found an important shellmound map (see below) drawn by famed archaeologist Nels Nelson in 1907. The Sacred Land Film Project interviewed Corrina and Malcolm to document the unfolding battle. When the comments on the Environmental Impact Report were tallied, there were 1,800 letters opposing the project and five in favor. The developers met privately with Corrina and tried to buy her off with a compromise offer. She said no thanks. The Ohlone could not allow ten feet of earth to be excavated even if they would get a cultural center and a strip of land. Corrina would not budge as she bought time and delayed. The developers changed strategy. For the first time, a new California law, SB-35, would be tested. The law was the work of Democrats in the Legislature, taking permitting decisions away from local boards and prioritizing new housing construction close to public transit. The shellmound site is adjacent to Berkeley’s Amtrak station. 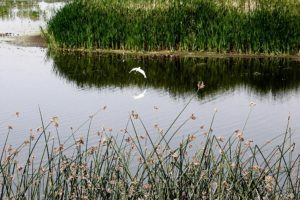 The developers dropped the environmental impact review of their original project, submitted revised plans that included some less expensive units, and invoked the new fast-track process to build affordable housing. The shellmound defenders had to shift into crisis mode. Corrina argued that the landmarked archaeological site should be exempt from SB-35. But would the Berkeley City Attorney support her argument? We went back to the Landmarks Commission. Dozens of citizens spoke against the project and urged the commission to defend the site. We went to the City Council where hundreds of supporters packed the chambers. Mayor Arreguin gave Corrina and her two excellent attorneys 30 minutes to make their case. The City had to decide by June 5. On that day, we all held our breath awaiting the 5PM posting on the Berkeley website. In the end, the Berkeley City Attorney came through, upholding the historic landmark designation and ruling that the developer could not hide behind SB-35. We all cheered, then braced for an expensive lawsuit stretching out for years. And then, on August 24, the developer pulled out. While it may be too early to call it a victory, it was a huge moment and we are still savoring it. One glance at Alaska’s Arctic National Wildlife Refuge and Utah’s Bears Ears National Monument teaches that no environmental victory is permanent. The landowners have vowed to push forward. The shellmound activists will remain vigilant as we pursue our alternative vision. We hope that the Trust for Public Land or the Archaeological Conservancy can persuade the owners to sell and deed the land to a trust. We hope Berkeley will hold fast and allow the last remnant of the Bay Area’s first human settlement to become a treasured landscape once again—a cultural park for all to enjoy, and a place for Ohlone people and newcomers to remember our common history. That will be a great film. Nels Nelson’s map from 1907 with a dashed line showing the shellmound boundary. Spenger’s Parking Lot at 1900 4th Street is number 88. Thanks to Chris Walker for going to NY to find this map!